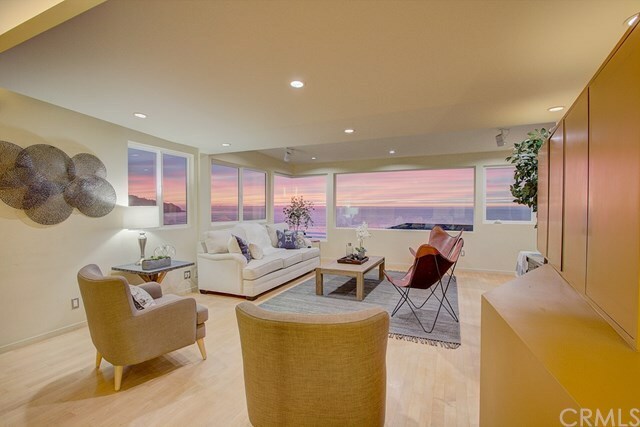 Do not miss this RARE Lower Riviera STUNNING End Unit Town Home with SPECTACULAR and Breathtaking Panoramic Ocean views...Unobstructed views from Palos Verdes to Malibu and steps from the Pacific Ocean. Views from the front living space all the way back to the kitchen, and in the Junior Suite Bedroom downstairs. Only one partial wall connected, so optimum privacy! This lovely home boasts gleaming hard wood floors throughout, and modern accents in its' entirety. The kitchen is open and flows into the living space for ideal entertainment of family and friends. Stainless Steel Appliances, upgraded cabinetry, recessed lighting and plenty of storage space through the kitchen, PLUS a bonus area just off the kitchen suited for an office space (fit with a pocket door to shut off from the rest of the home) or as an open space for a Yoga Retreat, play room or fit for a kitchen table as well for more casual dining..the possibilities are endless with a charming balcony connected!Don't miss the FULL bathroom upstairs behind the contemporary LUMAsite barn door! Downstairs you will find 2 Master Suites,one Suite with a view and one Master Suite with another bonus space great for a reading area, meditation room or mini office that leads out to a lovely back patio, large enough for outdoor entertaining! Laundry conveniently between the 2 bedrooms. Milgard Dual Pane windows throughout, Trex Decking, Two Car side by side secured parking! Walk to beach, The Riviera and Award Winning RB Schools! Directions: Esplanade turns into Paseo de la Playa...right on the water!